Enough of this sad story! 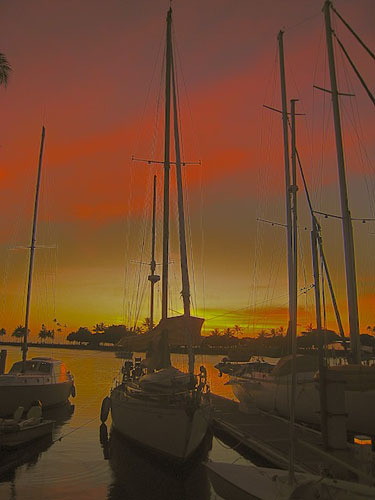 Photo by Ted Trimmer: Sunset at the Hawaii Yacht Club (Ala Wai Harbor, Oahu). The E.R. doctor referred me to a neurologist, whom I will see next Thursday, one week after being diagnosed with Bell’s Palsy. I am going to ask him to recommend the best plastic surgeon in Hawaii. Yes, if my face does not revert back to normal, I am going to undergo plastic surgery. Hopefully, it will be covered by my insurance. I was told 25% of patients never recover from Bell’s Palsy. I still can’t close my left eye and must use my fingers to do so. Patches are out of the question, because they press against my eyeball, making it very uncomfortable. With the application of an ointment, my left eye is virtually blind. All I see through that eye is a white cloud, making it dangerous for me to drive my car, especially on the freeway. I guess David will have to take me to my Thursday appointment with the neurologist. Eating meals and snacks has become arduous due to my inability to chew normally. I have to wipe my lips with a napkin constantly, so I won’t look like a messy hog. I can’t even rinse my mouth after brushing my teeth, because the water shoots out of the left corner of my mouth. Well, enough of this sad story, which could be a lot worse. Thank goodness, I don’t have cancer, diabetes, or heart disease! I should count my blessings and focus on the good things in my life, as we all should! This entry was posted on December 10, 2011 at 9:05 am and is filed under Uncategorized. You can follow any responses to this entry through the RSS 2.0 feed. You can leave a response, or trackback from your own site. You are wonderful to force yourself to be upbeat at a difficult time like this. It sure seems like a bunch of bloggers are facing challenges right now. I hope things start to improve quickly for you. I’ll be thinking about you. Oh, thank you, Kay. You are such a sweet, kind friend! I treasure our friendship. Good luck with your second mammogram! Gigi, let’s hope for the best, it may take months but a lot of people do recover….be patient and do whatever you can. It took about 6 months to recover from my 1st Bell’s Palsy, and even then recovery was not 100%. I still experience residual effects from the first one. I dread the outcome of this 2nd attack. I have had a friend who got this years ago. She recovered completely, but it took quite awhile (like several months). I’m hoping you will see improvement soon so it won’t be quite so difficult for you. I’m thinking about you and hoping you will at least still be able to blog and let me know how you’re doing! Virtual hugs, Gigi, lots of them! Friends of mine who had it have also recovered fully, in time. But what a bother, and what a scare! Take care, and be patient with yourself. Yes, the symptoms are scary! Gigi — before considering surgery, please do the “baby steps” and let the situation slowly, yes, dratted slowly, improve. I didn’t notice in your recent pics, nor in person about your previous residual. Yes, there was some with the smile right after your last recovery when you told us and shared your daughter’s wedding pics. David’s client had Bell’s Palsy in both cheeks. To fix the drooping, he underwent plastic surgery. Don’t really know if that helped, because he now wears a beard. Lol. I am so sorry about this. I have one friend with it, and it comes and goes. Thanks for telling us how you are tho. we care. So Sorry, Gigi….. I am keeping you in my prayers… I’m sure you will get the best care possible… God Bless You. Gigi, I have never heard of this term before.. you are very brave, very positive… I am sure you will get well… yes, do not despair, you are more fortunate than many others..
Will be saying a prayer for you and your family. Mahalo nui loa, GA Bows! Gosh Gigi, I have been so wrapped up in my own stuff, I haven’t been here lately, but I am sad to hear about your new affliction. I had a stroke six years ago which left the left side of my body in a twisted state. I had a twisted face and a mouth that could not utter words properly. I thought I would never stop drooling out of the side of my mouth. Finally after much therapy, things are relatively normal, except my left eyelid falls down and interferes with my vision. Some of your symptoms sound like Bell’s Palsy! Oh, so sorry to hear this! Hang in there. You should contact your insurance company and ask them. Good luck! I just looked this up as I had heard of Bells Palsy but was not sure what it was. So sorry you’re having to deal with this Gigi. Prayers heading your way. So sorry you are dealing with this Gigi!! (((((HUGS)))))) and prayers for you! Gigi..wait to see what the neurologist has to say first…it is awful and makes life miserable…sending you hugs….